Win Diapers and wipes for an entire year. 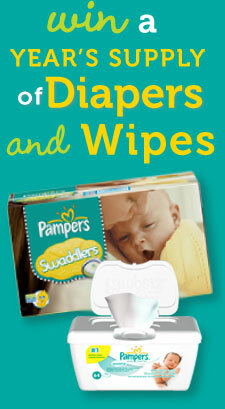 Click here to enter in the Pampers Sweepstakes. Pampers Gifts to Grow Rewards has got you covered with a sweepstakes every mom will love− coupons for 58 jumbo Pampers diaper packs AND 58 tubs of Pampers wipes. And it keeps getting better: enter as often as you’d like−there’ll be a new winner every month (view the current winners), and it’s only 20 points per entry. If you prefer, you can also enter by mail because there’s no purchase necessary to enter this sweepstakes. You have a chance to win diapers AND wipes for an entire year just by redeeming 20 points or entering by mail. It’s our way of thanking you for being a part of Gifts to Grow Rewards.